iLoveToCreate Blog: Creativity at work & a Doodles Unleashed book+product giveaway! 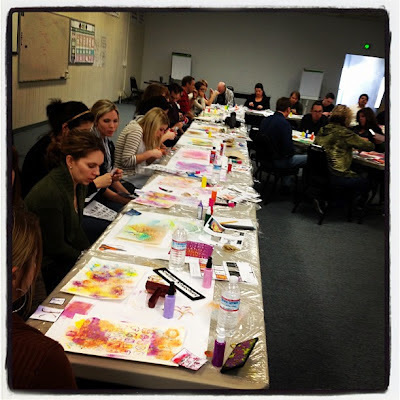 Creativity at work & a Doodles Unleashed book+product giveaway! At iLoveToCreate, our creative team always has a fun craft at our monthly meetings! This month, in honor of the Doodles Unleashed Book release, we were super stoked to get to watch part of Traci Bautista's new Doodles Unleashed Strathmore Online Workshop. It's now being offered for FREE on Strathmore's web site! We had so much fun playing along with Traci that we're giving away a super fun Tulip and Collage Pauge prize pack along with an autographed copy of Traci's new book Doodles Unleashed! See details at the end of this post for your chance to win! Here's our team busy at work! 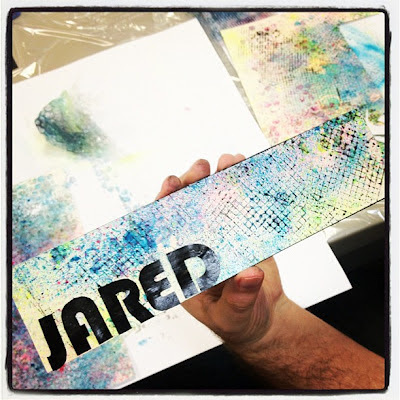 And an example of a finished name tag! Cool, huh? Now here's your chance to win this awesome prize pack! We're giving you 2 ways to enter! 1. Leave us a comment below telling us what you love to create. Please include your email address so we can contact you! 2. Pin one of the images from this post to Pinterest; you MUST tag them with #doodlesunleashed for your entry to count. 3. Tweet about this contest on Twitter; you MUST tag it with #doodlesunleashed for your entry to count. Contest ends March 16, 2012. I love to make my own cloths. I also love to quilt. Ooh! I would love to win this great prize package! Thanks for the chance. 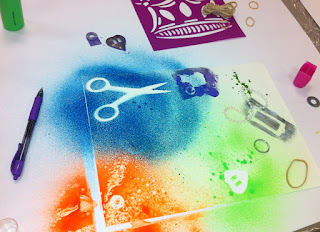 I love to do all kinds of crafts and right now I am really into stenciling on everything! From shirts to tote bags and pillowcases and cards. I started thinking about doing an art journal so this prize is right up my alley! I LOVE THIS! Going to pin asap. I like to create collages with painted papers I've made with the techniques that Traci teaches. I love to paint, and work in my art journal. Loved Traci's class on the Strathmore site!! Pinned and tweeted. I love to stamp and fabric paint on onesies for baby gifts. This would be perfect for that! I love to create all sorts of things. Lately I have been focusing on masks. I love to use a lot of mixed media on my masks, so this prize pack would be awesome! 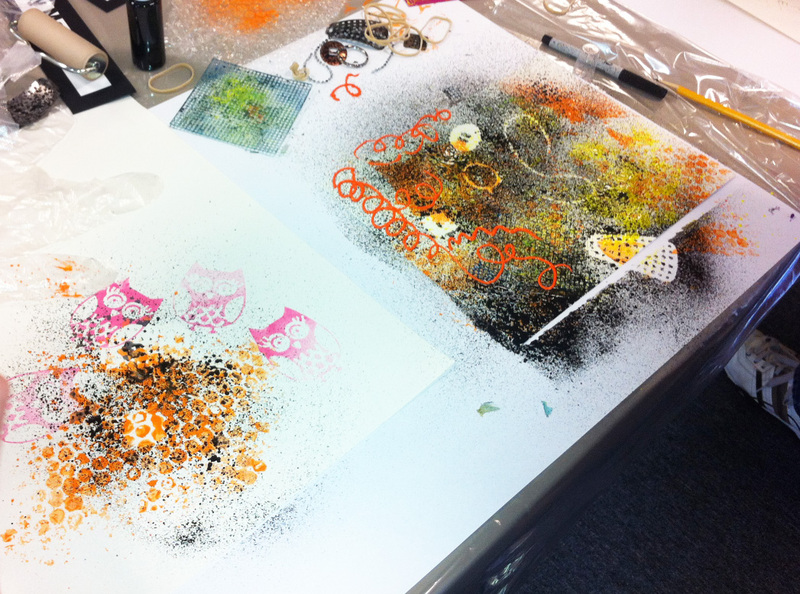 I LOVE to create mixed media art! 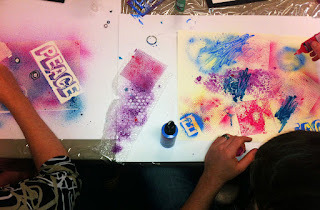 Traci's art techniques are a fun way to add embellishments to backgrounds. I love her books. I would love this one! Amazing stuff. I would love to use these products on my own mixed media artwork. I like to create whatever I have time for, space to do it, and with no little children near. Sometimes that's just doodling in my sketch book, sometimes knitting or crocheting, and sometimes scrapbooking or painting. Usually I'm scrapbooking, but I like to make useful gifts. Thanks for the chance to win this great kit of tools! I love to create anything! I have been creating my whole life, from sewing my own clothes to knitting for my sisters, embroidery, crochet, altered art, book making, doll making; now I create for and with my little grandaughters and hope to teach the all the things I know how to do. Art sets me free--mixed media collage, art jornaling, fiber arts--all of it, and any of it!!! Would love to win this give-away! I love to create art journal pages, pencil sketches and scrapbook layouts. Great contest...I'm off to make more entries!!! It might helps to follow the instructions. ☺ I would love to make covers for art journals. thanks for the chance to win! i love working in my art journal and making canvases as gifts! What a FAB giveaway! I love to paint and doodle on fabric! This is a great giveaway! I love to create journal pages and mixed media collages. I took Traci's Strathmore class and it was awesome!! I love creating in my art journal! It is so freeing to just paint, draw, play and be messy!! I love to create all sorts of mixed media art!! Especially art journals, and greeting cards right now. Good luck to us all! Thanks for a chance at this great prize. I love to paint,collage,sew, you name it!! Who would not be so excited to win this Doodles Unleashed giveway!!!!!!!!!!!!!! I don't use Pinterest or Twitter. I do love to do "my own thing" with art journaling and mixed media work. 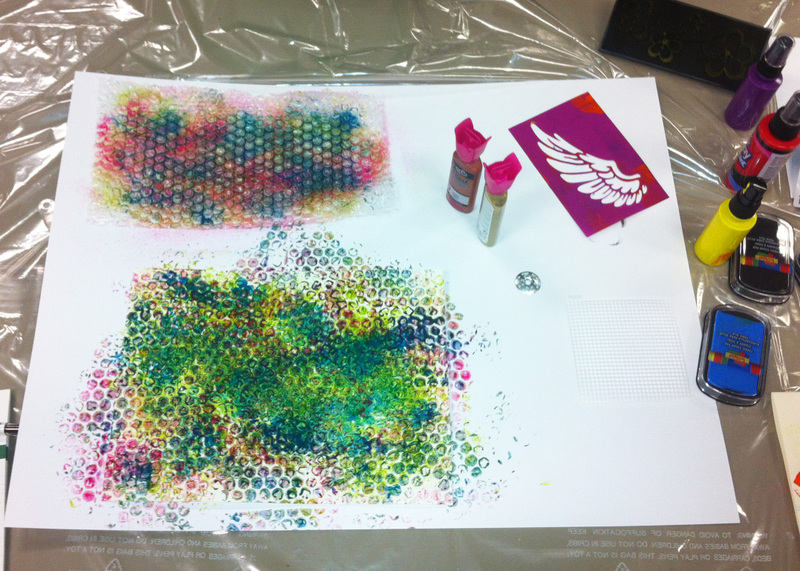 I took Traci's Strathmore class and bought several of the products that Staci used with great results. I would love to try those products. Thanks for the chance, Johanne L.
I love to create art journals, greeting cards, write and illustrate picture stories, canvas paintings, mixed media collage, ATC's...should I go on? Would love to try some of your products on fabric. By the way...great team meeting. All meetings should be like that. this would be great to make gifts with ! I love to knit and crochet hats. 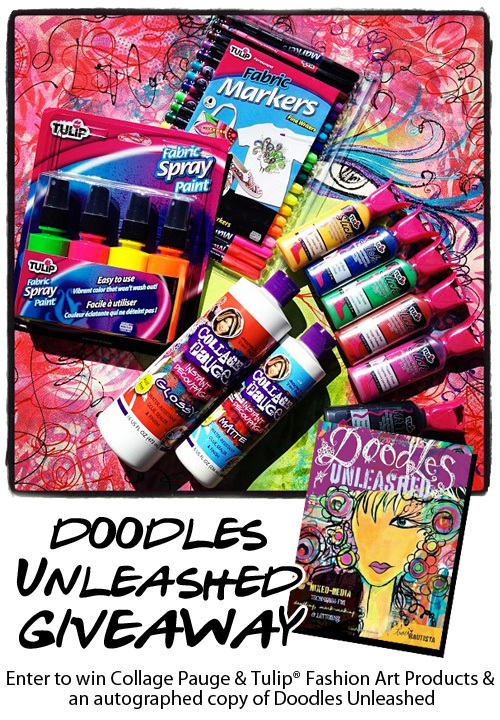 the doodles unleashed book is fab and the chance to win some of the fantastic products Traci uses is great. Handmade books and pretty much anything that makes people say "how did you do that?" my students and I love to create journals and art with products that Traci suggests...........love! I enjoy making doodle art inspired by Traci. Love her work. I'd love to win these products. I love to make mixed media projects, and my daughter loves to design tshirts. She'd love those fabric sprays. Thanks for the chance. also love to just make things and presents (especially buttons and cards). i love to color adult coloring pages,i also doodle in my idea book,many of which i have painted as abstacts,which is my faorite form of painting.being disabled and basically stuck in my house i try to find ways to entertain myself but at the same time,are cost effecient.my son calls me the "DOODLE QUEEN".i paint ceramics,and i am trying my hand teaching myself how to make jewelry[still a work in progress],i would love to win,for several reasons,but mainly because i really could use the supplies,and i'd love to own the book. Right now, I'm busy experimenting with different paint products in my art journals. I love using stencils and stamps! Great giveaway! Right now it's all about fabric for me .. mixed media fabric art journals, art quilts and pillows. I love scrapbooking and mixed media forms of art. I pinned the first picture using the hash tag #doodlesunleashed. I newly love to create layered doodles. 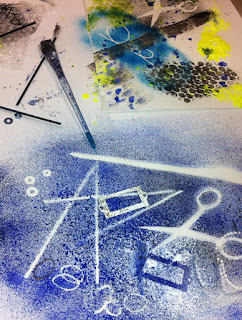 I make an abstract painting then use a myriad number of markers etc to embellish the painting. I'd love to win this prize, it would add to my meager stash of art supplies. I like to make cards for special or everyday occasions. Would love to add doodling to my card technique repertoire! Like many of the obviously talented artist-types on this page, I adore creating in my Art Journal, and would love to expand that to clothing, my furniture and my cat! Ok, not the poor kitty, but you get the idea. This giveaway has inspired complete Collage Lust and I would love a chance to play with these gorgeous supplies! my favorite to create is art journals and mixed media paintings. I live art. looks like so much fun!! i love to create almost everything from scrapbooks to canvases. i just love to get inspired and go for it. I like a little bit of everything-that's why I identify with "mixed media artist". I dabble in all sorts so would class myself as a mixed media fan. I am wanting to make sure book themed t shirts like hunger games, etc. and this would be great to do that! I love working in art journals especially finding random objects around the house to use. I am a book artist and love to create a variety of different types of books -- crushed aluminum can books, altered books, folded books, accordion books, X books etc. I also enjoy art journaling. This is a great giveaway. Thanks for the chance to win these awesome products. If I'm the lucky one please contact me at bkisrael@gmail.com. I love to paint and create doodles for cards, gifts, books and journals. Thank you for this opportunity.